Indians are nowadays very influenced with Italian food like, pasta, spaghetti, lasagna etc. My daughter just loves pastas any time. She would be the happiest person if I serve her pasta all 3 times of the day. For a change, I made this pasta with Indian spices and tempering..totally mouth-watering and suits our Indian taste-buds. I make this often when I feel like eating something chat-pata(spicy & tangy) but filling. Green chillies : 1-2, chopped or green chilli sauce : 1 tsp. Cook your pasta in a big bowl of water until just done with a tsp. of oil and a pinch of salt added. Drain and set aside. Heat oil in a pan, temper with cumin seeds, then add sliced onions and fry till onions are light brown. Now add sliced vegetables, carrots and green beans first, then spinach, capsicum and spring onions. In medium high heat, saute till they are just done. Add chopped green chillies, garlic paste and chopped tomatoes and stir for a minute or two or until tomatoes softens. Add turmeric and red chilli powder, add cooked pasta, tomato ketchup and green chilli sauce. mix everything well. Season with salt. Adjust the spiciness according to your tolerance level. 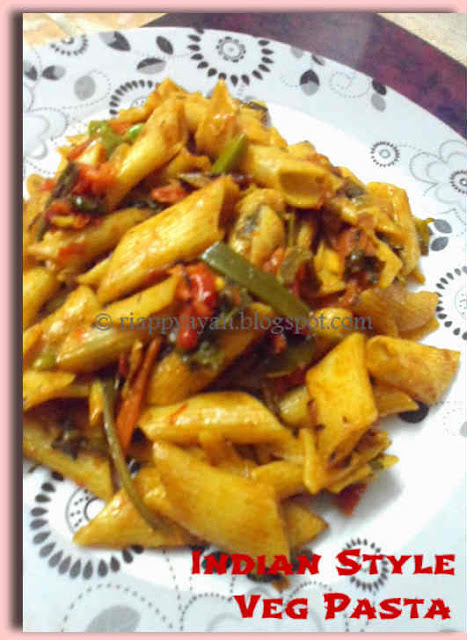 Stir for some more time and a chat-pata(tangy), spicy pasta is ready to tickle your taste bud. Indian pasta looks much more colorful than the western ones. Must have tasted great as well. Am in love with this Indianised pasta, lovely fusion. Hey, Nice post . 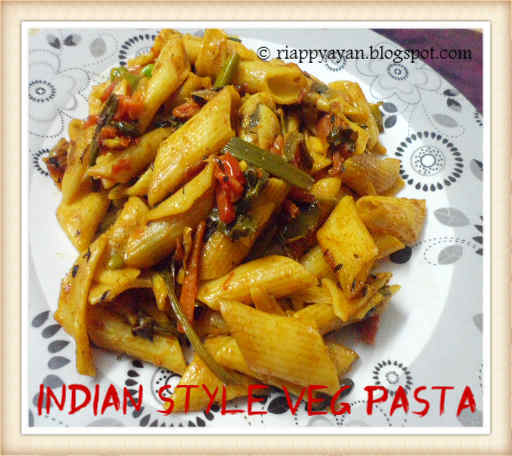 I have tried pasta with Indian spices at some restaurant and it tastes amazing, I was looking for the recipe since so long . Thanks for sharing I am surely gonna try this . I often order food online but before doing so I read the reviews and search for the best deals online . One destination that provides best quality food, on time delivery and at best prices is Foodpanda . I have recently used Foodpanda coupons from GrabOn which is a coupon website and it was very helpful , I saved on my purchase . You can also do the same and save on your next order .